Natural Flavours and Sweetener (Stevia), Purified Water. Our flavoured Stevia drops are a natural way to flavour your protein shakes, porridge, tea and coffee, dairy snacks, water or healthy protein baking. Highly concentrated, all natural, and very easy to use, they offer the ideal solution for a sweet tooth when you don't want to use sugar or artificial flavourings. Steviol glycosides are found naturally in the sweet-tasting leaves of the Stevia plant. 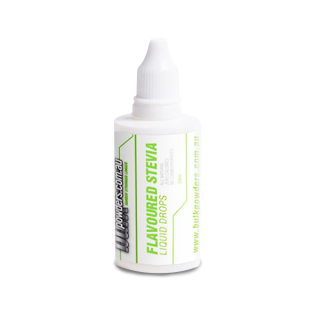 Steviol glycosides are heat and pH stable, making Stevia flavour drops ideal for use in tea, coffee, protein puddings and healthy baking. Bulk Powders Australia's all natural flavoured Stevia drops are extracted and processed using purified water, no chemicals or alcohols. The concentrated Stevia extract is made in a unique way that eliminates the slightly bitter aftertaste normally associated with Stevia products. Our Stevia flavour drops are sweet and delicious. Use Stevia flavour drops in your hot drinks, still or fizzy water or in your healthy baking kitchen experiments. Or simply use them to create your very own bespoke flavours of protein shakes. Our flavoured Stevia drops are the ideal way to naturally flavour our natural (raw) range of protein supplements. Find your favourite flavour or mix it up to create a different taste every time. Choose from caramel, chocolate, lemon lime, mango, strawberry, vanilla, vanilla lime, wild berry or natural. Natural sweetener, calorie-free, zero sugar, sugar alternative, heat stable, no chemicals. All-natural sweeter drops in nine amazing flavours, ideal for flavouring protein shakes (particularly raw/natural protein powders), tea, coffee, water or any snack or baking. Made from the Steviol glycosides of the Stevia plant. A completely natural, chemical-free sweetener product. Zero carb, zero calorie, zero sugar, zero fat. As a dietary supplement, add 5-10 drops to your chosen food or beverage. Sweetness and flavour depends on personal taste. Our suggested use is just a guide. Flavour drops can also be mixed to create even more flavours (choc-caramel, strawberry-vanilla, etc). This is such a great find! I use the chocolate flavor to sweeten and flavour my oats and cottage cheese, and the vanilla flavour for my tea when I have a sweet craving. You only need 2 drops so it will last forever. Awesome! Raw powders that need a taste boost. Does what they are supposed to do and changes the raw powders into something more appealing. I will probably try a different flavour next time, and see how that goes, but am happy. They are great. Bought for diabetic son so I can add to low carb greek yoghurts/baking etc. He loves them and wants them in water and everything. Would definitely buy again and have recommended on diabetes facebook group. Would love some other flavours :) raspberry and blueberry maybe. Protein shakes, sparkling water, protein pancakes. etc. I freaking love these drops! I'm a huge flavour junkie and these add such a fantastic sweetness and added flavour to ANYTHING you want to add more flavour too! Keep up the great work BP! Would be great to see some more flavours in the future too like apple, blackcurrant, grape and Cola. Really nice mixed with protein and also yoghurt - makes plain taste amazing! Need more drops than the suggested ratio for some flavours but it's an experiment! I love the control the stevia drops give me in the sweetness of my shakes. the vanilla is great as I can easily add cacao and other flavours to my shakes as well.